This family-friendly Mainz hotel is located on a river, within a 10-minute walk of Rheingoldhalle, Gutenberg Museum, and Naturhistorisches Museum. Mainz State Theater and Mainz State Museum are also within 10 minutes. Mainz Römisches Theater Station is 15 minutes by foot and Wiesbaden Mainz Kastel Station is 15 minutes. This family-friendly Mainz hotel is located on the riverwalk, within a 10-minute walk of St. Ignaz Church, Gutenberg Museum, and Augustinerstrasse. Augustinerkirche and Kirschgarten are also within 10 minutes. Mainz Römisches Theater Station is 8 minutes by foot and Mainz Central Station is 24 minutes. Located in Mitte, this spa hotel is steps from Goldgasse, Kochbrunnen, and Heathens Wall. Cuckoo Clock and Wilhelmstrasse are also within 5 minutes. Wiesbaden Central Station is 22 minutes by foot. How Much is a Hotel Room in Burg-Hohenstein? Hotels in Burg-Hohenstein start at $87 per night. Prices and availability subject to change. Additional terms may apply. Are you researching a trip to Burg-Hohenstein? Travelocity features no hotel options, however, you will find 2 rooms within a 10-mile (16-kilometer) drive of Burg-Hohenstein. The nearest Travelocity-listed hotel is the Nassauer Hof, Rhineland-Palatinate, which is 11 miles (18 kilometers) from the downtown core of Burg-Hohenstein. A second handy Travelocity-listed accommodation option is the Schloss Reinhartshausen, which is in Rhineland-Palatinate, about 12 miles (19 kilometers) from the middle of Burg-Hohenstein. You should check out the Hyatt Regency Mainz and the Favorite Parkhotel. The Hyatt Regency Mainz is positioned 17 miles (27 kilometers) away from the heart of Burg-Hohenstein. The Favorite Parkhotel, is situated just 17 miles (28 kilometers) away. Some other accommodation options around this area are the Hilton Mainz City and the Atrium Hotel Mainz. Researching so you can get a little bit further afield? Hessen offers many exciting attractions. Hessen offers forests, rivers and streams. The best visitor places of interest include castles. Sporty travelers can engage in mountain biking in the area. Wiesbaden is 12 miles (19 kilometers) southeast of Burg-Hohenstein and features Cuckoo Clock and Kurhaus. 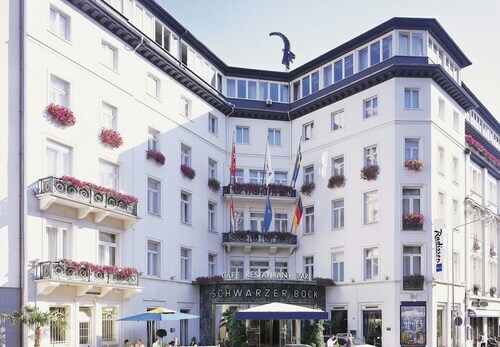 The Dorint Hotel Pallas Wiesbaden and Radisson Blu Schwarzer Bock Hotel are just some of the hotel choices in Wiesbaden. Or stay in Ruedesheim am Rhein, 14 miles (22 kilometers) southwest of Burg-Hohenstein, where you can choose from the Hotel Krone Assmannshausen and Altdeutsche Weinstube. If you stay in Ruedesheim am Rhein, set aside some time to check out the Georg Breuer Winery and Ruedesheim Cable Car. Before your Burg-Hohenstein trip draws to a close, why not spend an afternoon experiencing the high energy with avid sports enthusiasts at an exciting match. You can find Commerzbank-Arena 25 miles (44 kilometers) to the east of Burg-Hohenstein. Those that would like to find Travelocity-listed accommodation options in the area around the game can compare between the Rocco Forte Villa Kennedy or the Maritim Hotel Frankfurt. Frankfurt International Airport is a closeby arrival point for air travel, and is found 25 miles (40 kilometers) outside the heart of Burg-Hohenstein. 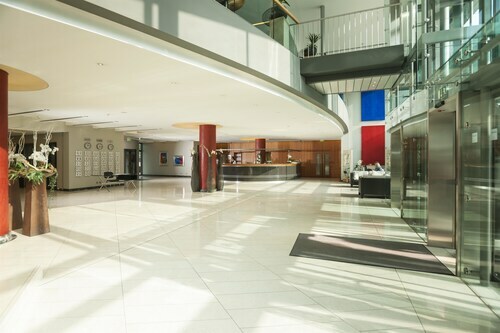 Travelocity-listed hotels located close to Frankfurt International Airport are Sheraton Frankfurt Airport Hotel & Conference Center and Hilton Frankfurt Airport. It was around a shopping center. The room was clean, staff was nice. Love staying in this area. Town is small enough to walk around with great diversity. The NH is nice, but, I feel it needs some TLC in the maintenance area. Overall, it is a nice place to stay. We were on a recent trip to Germany for a wedding and some vacation time and stayed here. LOVE THIS PLACE! Super comfortable room with a great bed and wonderful view of the wine making countryside. On the Rhine riverfront near the train and everything else. Great location and walk everywhere. Bar opened 24 hours. So fun for late night wine and beers with other tourists from France, Germany and the Netherlands, etc., Very entertaining. Service was attentive, nice breakfast included with a great assortment of German foods/treats. Great shower and super comfortable. Beautiful little hotel. This is a Go!